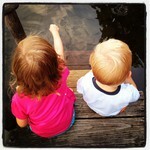 My two kiddos at our favorite summer place, Silver Lake. Piper says, “Look at the water Brocky! We can swim in there!” I am hoping to pass on my love of the water and swimming to my kids. I want them to be little fish just like I was as a kid (and still am).